It is no secret, I love the impressionist movement. But how exactly do you paint in an impressionist style? Many artists seem to use it as an excuse to paint sloppy. But really, impressionism is just a relaxed form of realism in my opinion. 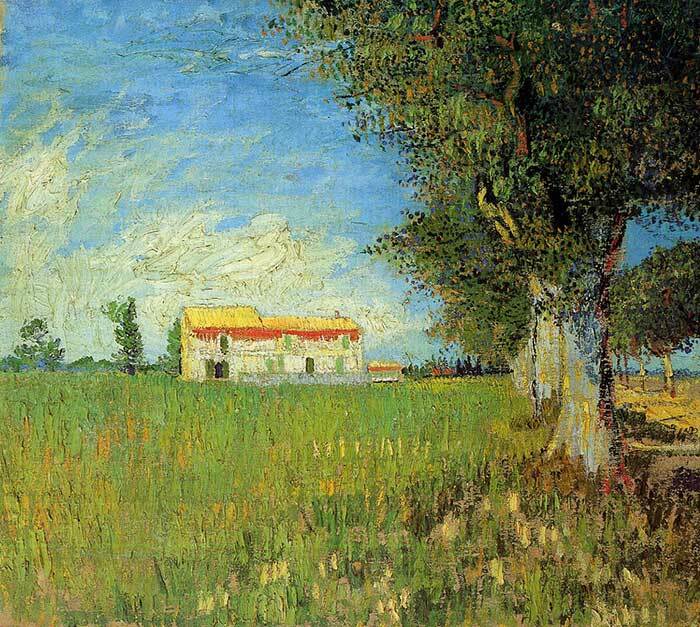 Accuracy is still extremely important in impressionism. 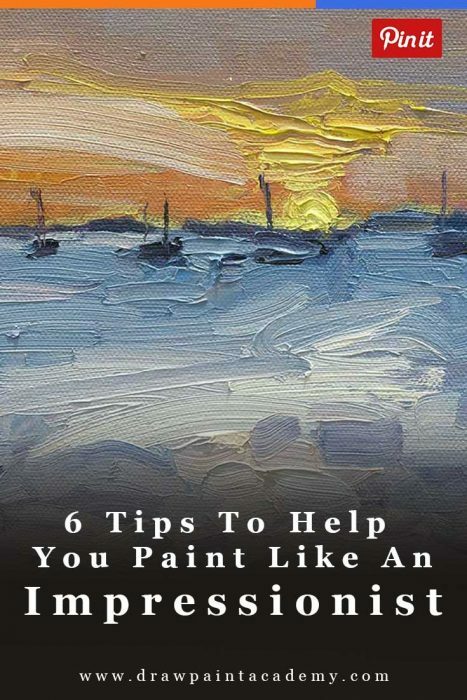 In this post, we will run through some tips to help you paint like an impressionist. Compositions which place you in the painting. If you look up close at many of Claude Monet’s paintings, you will notice that he rarely used a static color, but rather a myriad of broken colors which optically blend together when viewed from a distance. 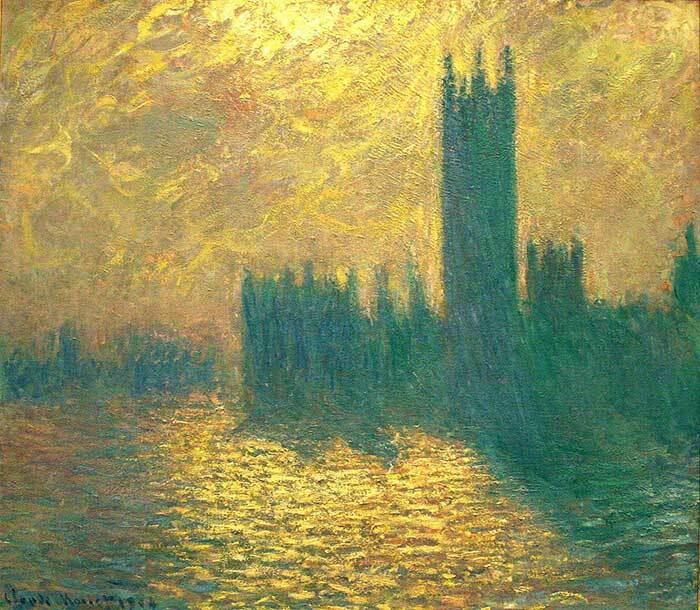 This gives Monet’s paintings a certain depth and vibrancy which few artists seem to be able to achieve. Instead of painting the sky a static blue, Monet often used a range of broken yellows, purples, blues and greens. 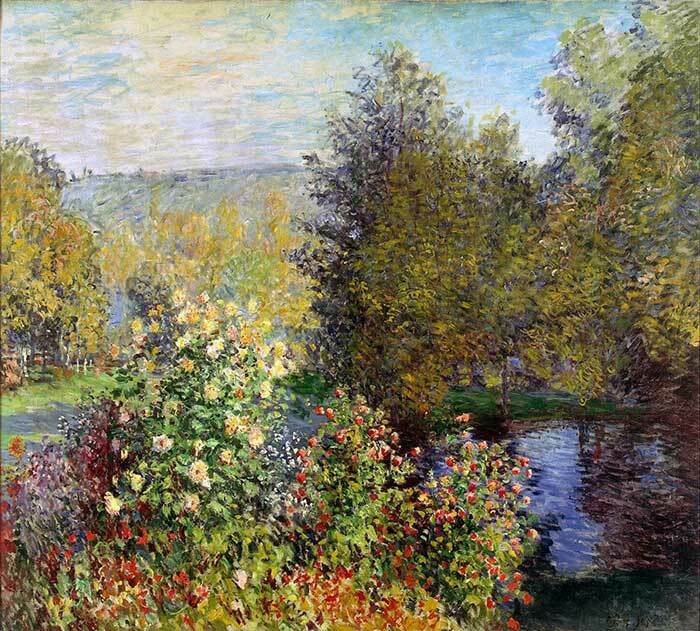 Instead of painting trees a static green, Monet used broken reds, yellows, greens and blues. 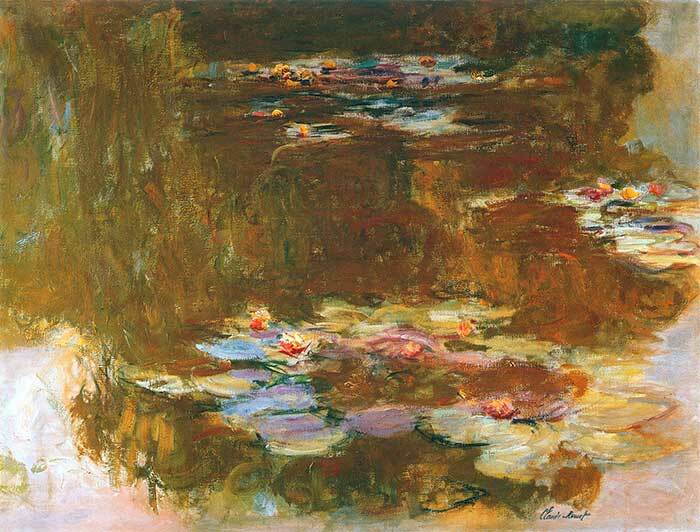 In most cases, Monet used a dominant color and many accent colors. 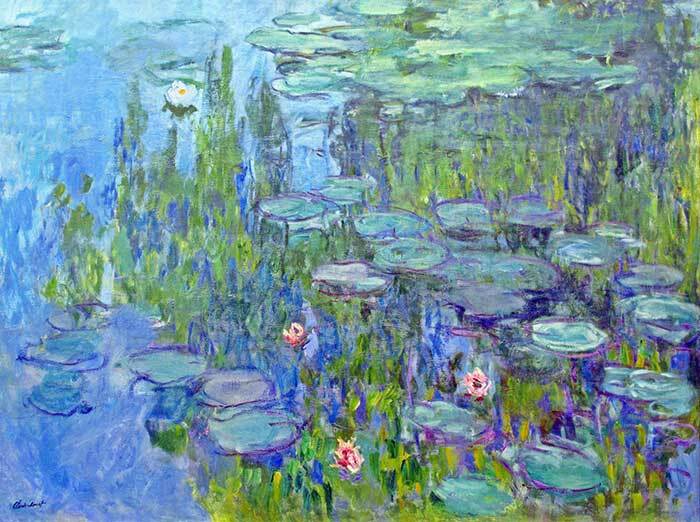 His paintings of water lilies are brilliant examples of broken colors. If you look up close, you can see just how many colors he used all through his paintings. Yet when you step back, everything works in a peaceful harmony. If you are interested in this broken color effect, then you should also check out this post on the pointillism art movement. The top impressionists were not afraid to use bold and almost aggressive brushwork. If used appropriately, this kind of brushwork can add a very dynamic element to your paintings. 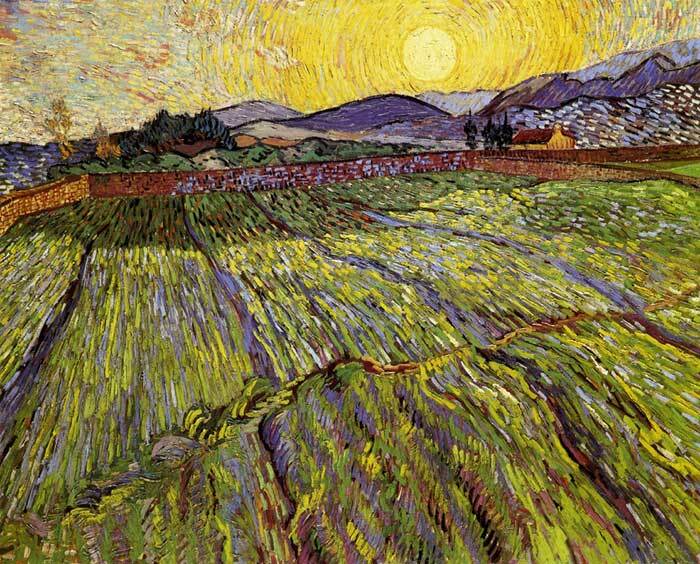 Vincent van Gogh is obviously the first artist to come to mind when we think of bold brushwork. In my opinion, his brushwork is one of the reasons for his great fame post-mortem. Painting like an impressionist can best be achieved by using brushes much larger than what you are usually comfortable with. This will help you generalize shapes, colors and other elements in your paintings. But make no mistake, it is not easy to paint with large brushes and every stroke needs to be calculated and have a purpose. The best way to learn how to paint with larger brushes is just to force yourself to use them. Put away your smaller brushes and try to complete a few paintings with just larger brushes. In my small painting below, I used a very large brush for the entire painting. You can see the large brushstrokes in the sky. The palette knife is an underrated painting tool in my opinion. You can create such interesting effects using the palette knife and it can help you paint like an impressionist as you can use it to apply thick areas of varied colors without going into too much detail. 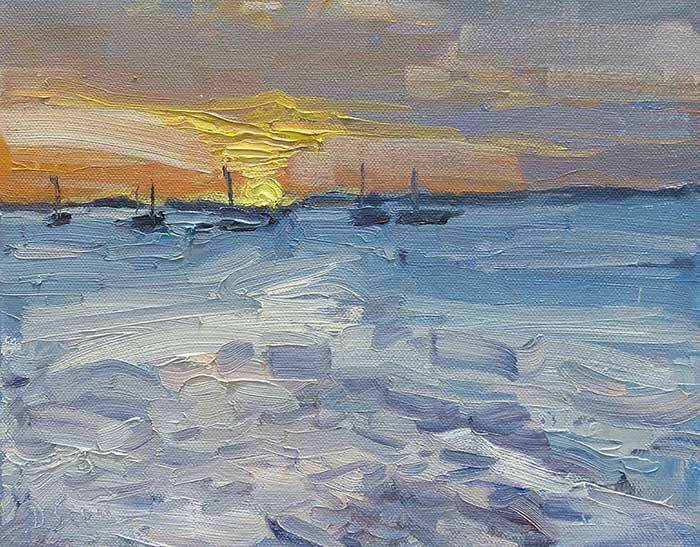 The palette knife is also perfect for adding small accents and highlights to your paintings (for example, the bright glimmer of sunlight which is hitting the top of the water in the distance of your seascape). 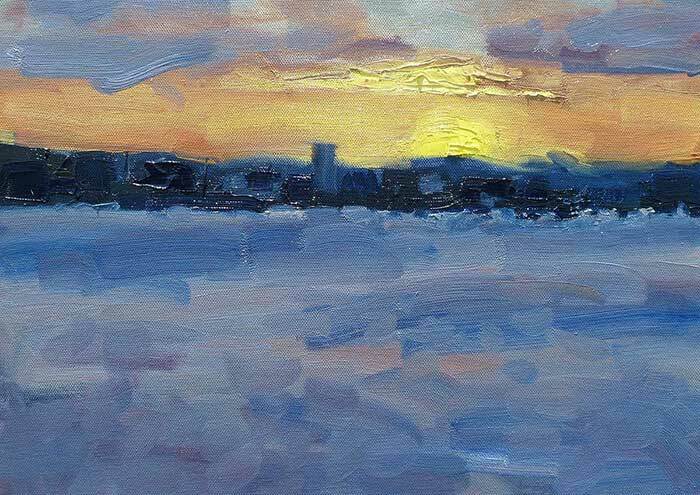 In my painting below, I used the palette knife to paint the dramatic yellows of the sun. I wrote more about using the palette knife in this guide. Many of the great impressionists skillfully contrasted warm and cool colors in their paintings to create stunning effects. This can be most effective when you have a dominant warm (cool) color contrast against a weaker cool (warm) color. For example, a dominant orange looks very brilliant when contrast against a dirty blue color. To paint like an impressionist, you need to determine what is actually important in your painting and simplify the rest. If you start adding every detail in the scene you are painting from, then the overall message of your painting will get lost. You want to try and communicate your message through your painting with as few words (strokes) as possible. Most of these tips will help you simplify the clutter in your paintings and communicate what is actually important. That after all is what impressionism is all about. Do not confuse impressionism with just reckless painting. Anyway, I hope these tips help you with creating your next impressionist painting. Great ideas, simply described and well illustrated. Thanks for these tips! Thanks for the very kind words Hashem! Great article — simply offered, well written, easy to read and full of wonderful creativity boosters. My one suggestion would be to call up some relevant examples for all (and not just some of) the tips you offer. The examples of other well known artists lends credibility, so avoid using your own examples. For instance, I’d have loved seeing some examples by a well known impressionist artist to illustrate your 3rd and 4th tips. Hi Rob. Thanks for your very thoughtful feedback. I will try add some more examples to this post when I have time and certainly to future posts! Regards, Dan. I have not mastered how to appreciate great paintings of the past masters. I find your (Dan Scott’s) paintings very attractive and the explanation is highly reasonable. You do not have to drop your examples. They are simple and charming. I have entered my email address to subscribe but get the message that my email address is invalid. ???? I will check to see what the issue is. I HAVE ALWAYS LIKED THE IMPRESSIONISTIC WAY OF PAINTING. I WANT TO PAINT MORE WITH A PAINT KNIFE TO BE ABLE TO PAINT THAT WAY. Thanks for sharing with us. Claude Monet is one of my favorite artists, and here lately, I have this desire to paint more in the impressionist style, because of what I have read about Claude Monet. 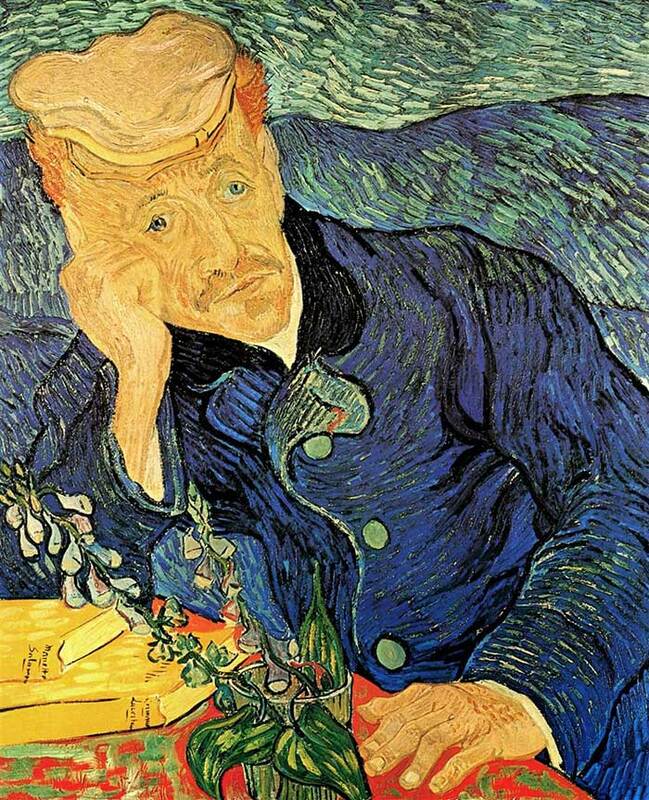 I even admire the kind of man he was in life, and I love the impressionist style he has paved the way for in art. I am working on a painting now that is still not all the way like Claude Monet’s, but I did use a palette knife in the background underpainting, so that helped leaning toward the impressionist style. I have Peruvian lilies, chrysanthemums, which was easy for the quick and short brushstrokes for the Impressionist style, and roses. I worked on the background last night, giving it less details, and that helped it lean toward the impressionism style. Thanks for sharing the Impressionist style with us. Really appreciate your article–I’m newly inspired!